Ernie Humphrey, CEO of 360 Thought Leadership Consulting, will discuss how visibility into T&E processes and expenses—when combined with the right industry benchmarking—allows companies to take control of corporate spend while also directly impacting top-line revenue and the bottom line. Join an open product demonstration of the fully automated expense management solution from Certify. Join an open product demonstration of the fully automated expense management solution from Certify. This event is specific for those located in Europe. Join an open product demonstration of the best-in-class procure-to-pay solution that simplifies the spend management process and drives efficiency through automation. Meet the newest addition to the leading Certify automated expense platform. Invoice imaging, flexible and locked approval workflows, ACH payments and more—find out how Certify Invoice makes AP and cash management easy. Get the powerful product features and services every global business needs to thrive. Advanced travel policy enforcement, support for international travelers, duty of care functionality and single sign-on capabilities are just some of what's available. December 13, 2018: In a world of increasing personalization, business traveler expectations are being elevated to a point where their needs must be met at every step along the way. How will the transformation of the T&E landscape impact the finance department at your organization? December 4, 2018: Tech brands are transforming the business travel and expense landscape—and business traveler expectations. Join us as we look at the biggest trends in corporate travel and how finance leaders can create a future-proofed corporate travel policy that will help manage spending and cut costs—while also meeting the needs of business travelers in 2019. November 28, 2018: Join Ernie Humphrey, of 360 Thought Leadership Consulting, as he examines the top priorities of today’s CFOs and how automation can help to achieve these goals. He will walk through five strategic themes that your business case must address if you want buy-in from the c-suite. October 30, 2018: According to the 2018 Expense Management Trends Report by Certify, Inc., 49 percent of businesses still rely on manual expense reporting processes. That’s a surprisingly high proportion considering the compelling business case for automation. October 16, 2018: Certify's 2018 Expense Management Trends Report shows that 49% of businesses still rely on manual expense reporting processes. Why are organizations so slow to change? Very often, it’s because when finance leaders present the business case for automation to their CFOs, they fail to explain it in terms that the CFO cares most deeply about. In this webinar, we’ll examine the top priorities of today’s CFOs and how automation helps to achieve these goals. October 9, 2018: There is little dispute about the value of a comprehensive T&E policy. This webinar will cover how an effective T&E policy and moving to an automated solution can help your organization eradicate inefficiencies and control costs. September 25-26, 2018: At the Certify User Conference in San Diego, attendees were offered a great opportunity to learn, network, earn CPE credits and share ideas about Certify. September 11, 2018: Business travel is essential to growing your business—whether for building your network, or having a face-to-face meeting with that dream client, a work trip can mean the difference between a good year and a great one. August 29, 2018: We surveyed more than 500 CFOs, controllers, and financial professionals to uncover the top T&E (travel and expense) trends that are impacting businesses today. August 2, 2018: Organizations both large and small recognize the value of a comprehensive travel policy. However, simply having a company T&E policy is no guarantee that employees will follow it. July 26, 2018: With so many expense solutions available today, you may be surprised to learn that 49 percent of organizations have not yet leveraged automation to improve their expense management process. July 18, 2018: This webinar shares exclusive new data on T&E spending and provide proven strategies for getting the greatest return on investment for your T&E dollar. July 10, 2018: Learn how mobile technologies are transforming corporate travel and expense reporting, strategies to simplify expense management, and the best practices for transitioning to an automated process. June 25, 2018: Expense management is a critical function, but it can be challenging for the finance team and travelers to efficiently compile and process expense reports and ensure compliance. June 19, 2018: How often do you have to track employees down to validate suspicious expenses? Have you ever calculated how much time expense policing is costing you? 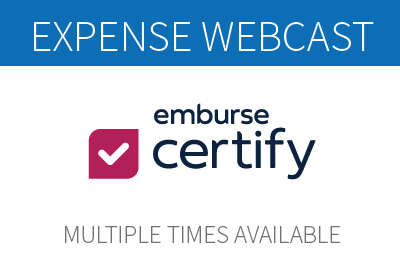 If you dread auditing employee expense reports every month, this webinar is for you! Join Ernie Humphrey, CEO of 360 Thought Leadership Consulting, for this educational webinar! May 15-16, 2018: At the Certify User Conference in Chicago, attendees were offered a great opportunity to learn, network, earn CPE credits and share ideas about Certify. April 24, 2018: Second only to payroll, travel and entertainment (T&E) spending represents the largest business expense for companies. T&E is also the second most difficult operating expense to control. Join Ernie Humphrey, CEO of 360 Thought Leadership Consulting, to learn about how T&E is impacting your bottom line. November 16, 2017: At the Certify User Conference in San Francisco, attendees were offered a great opportunity to learn, network and share ideas about the Certify travel and expense management platform. December 19, 2017: When it comes to company expense management priorities, is your team prepared for the year ahead? Join us and find out what more than 600 finance and accounting professionals identified as their top employee-initiated and travel and entertainment expense challenges, pain points and pressures to succeed in 2017. November 29, 2017: Get the latest insights into today’s business travel trends and how they’re driving the purchase decisions and preferences of your employees on the road. You’ll also see survey results from more than 600 companies with insight into the tools and best practices they’re using to manage the expense reporting and reimbursement process. November 12-14, 2017: Certify headed to Vegas to exhibit at the largest, most comprehensive event dedicated to Accounts Payable and Procure-to-Pay. This event brought together experienced practitioners and innovative strategists to provide an in-depth three-day learning experience. November 8, 2017: From Big Data to Actionable Intelligence to even Phat Data, travel buyers are inundated with information. All this data can overwhelm, causing ‘analysis paralysis'. Alternatively, it can be the foundation for a managed travel program that not only survives but thrives. It takes both buyers and suppliers working together to deliver impactful data for the managed travel program. October 27, 2017: For many companies, corporate travel offers a great opportunity to build relationships and support growth. But left unmanaged, T&E expenses can undermine growth by bringing about a drain on revenue. The main reason companies are not able to maintain control over T&E expenses is that they continue to depend on manual processes to keep track of them. October 25, 2017: To better understand the market forces, developing trends, and technologies that companies are using in the AP invoice process today, Certify surveyed more than 300 accounting professionals from outside its customer base to reveal the top accounts payable benchmarks and trends for 2017. October 15-18, 2017: Certify headed to the AFP Annual Conference, where thousands or treasury and finance professionals convened to gain practical knowledge, discover innovative solutions and validate best practices. October 5, 2017: Join us to discover how companies of all sizes are leveraging technology toestablish visibility, benchmark costs and expenses, and establish controls which lower expense report processing costs, fuel more effective T&E spend (less spend or more spend in the right areas), and improve productivity across the enterprise. Sept. 20, 2017: To better understand the market forces, developing trends, and technologies that companies are using in the AP invoice process today, Certify surveyed more than 300 accounting professionals from outside its customer base to reveal the top accounts payable benchmarks and trends for 2017. Sept. 6-8, 2017: Certify headed to Accountex USA, the leading independent accounting technology conference and expo where accounting professionals and solution providers to came together to learn, explore, and connect. August 30, 2017: In this presentation, you will learn what issues other companies like yours are facing in the AP invoice process, and what strategies and practices companies are using today to overcome common challenges. August 22, 2017: The latest webinar from Certify will show you how companies like yours are reducing overhead processing costs and streamlining workflow to quickly deliver a full return on their investment in automation. August 17, 2017: This webinar from Surgent shows you what leading companies are doing to overcome their T&E expense challenges and leverage findings from the survey to improve expense reporting at your company. August 16, 2017: The latest webinar from Certify will show you how companies like yours are reducing overhead processing costs and streamlining workflow to quickly deliver a full return on their investment in automation. August 2, 2017: This latest webinar from Proformative and Certify shows you how organizations of every size and industry are using automation to reduce overhead cost and streamline workflow processes in order to maximize the return on their valuable T&E investment. July 19, 2017: This webinar from IOFM and Certify shows you how companies like yours are eliminating inefficiency, reducing overhead processing costs and streamlining workflows. July 15-19, 2017: Certify joined in on GBTA 2017, the world's largest business travel event, which included exclusive networking opportunities, educational meetings and influential keynote sessions. June 28, 2017: At the Certify User Conference in Chicago, attendees were offered a great opportunity to learn, network and share ideas about the Certify travel and expense management platform. June 22, 2017: This latest webinar from Ardent Partners and Certify presents a comprehensive, industry-wide view into accounts payable trends, approaches and technologies based on the insights of nearly 200 AP and finance executives. June 22, 2017: Certify and IMA took a look at how travel and entertainment expense spending is an important growth strategy for companies of every size. June 17-21, 2017: Certify joined over 800 CFOs, accountants and finance professional for the IMA Annual Conference & Expo. May 23-25, 2017: Certify attended the Windy City Summit, a three day event that brought together top treasury professionals to network and share ideas on a variety of financial topics. May 16, 2017: At the Certify User Conference in Atlanta, attendees were offered a great opportunity to learn, network and share ideas about the Certify travel and expense management platform. May 9-11, 2017: Certify headed to Atlanta for Sage Summit: Atlanta to discover technology insights and innovations to take your business to the next level. May 10, 2017: This live webinar explored what other businesses like yours are doing to effectively manage the T&E process and leverage the findings to improve expense management. May 7-9, 2017: Certify will headed to Orlando for the Accounts Payable & Procure-to-pay conference, where thousands of industry professionals networked and shared ideas on accounts payable and procurement processes. May 3, 2017: This webinare dove into a 2017 survey of more than 600 CFOs, controllers and accounting professionals that revealed what today's small, midsized and enterprise businesses are doing to manage the most notoriously challenging areas of company spend. April 26, 2017: This webinar explored the top T&E trends and approaches to expense management for today's small, midsized and enterprise businesses. April 23-26, 2017: At the leading industry event, Payments 2017, thousands of payments system administrators and managers were united to explore today's payments solutions trends and opportunities. April 19, 2017: Certify Explores results from the 2017 T&E Expense Management Trends Survey. April 5-6, 2017: Certify made way to London for the UK Sage Summit, taking home new insights to help bring your business to the next level. March 22, 2017: The CFO Alliance and Certify discuss T&E expense trends and benchmark spending for 2017. March 7, 2017: It can be difficult to spot patterns in employee spend behavior, especially when the expense reporting process is largely manual. This webinar shed light on what is often a murky, poorly controlled area of the budget. February 22, 2017: The CFO Alliance and Certify discuss 2017 trends from a recent sentiment study of over 500 CFOs, and gain insights on key drivers of growth and profitability. February 9, 2017: Certify joined the APP2P Network for an in depth review and analysis of the top trends and best practices in expense management today based on results from a recent survey of more than 600 CFOs, controllers and accounting professionals. November 15-18, 2016: Certify headed to Las Vegas for the accounting industry's largest educational and technology conference. In addition to our booth on the exhibitor floor, Certify also hosted a panel discussion with customers and finance experts. 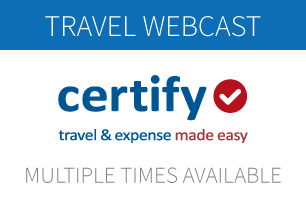 November 1, 2016: Certify and AP&P2P teamed up for a webinar where we discussed how companies are profiting by investing in travel and entertainment expense spending. 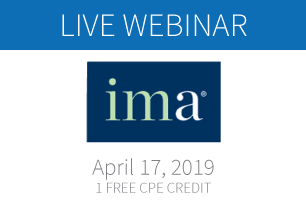 Plus, explore new strategies and best practices to help you control costs, increase policy compliance and maximize productivity. October 24-26, 2016: Team Certify flew out to Las Vegas to be a part of the largest, most comprehensive event dedicated to the issues and opportunities facing accounts payable practitioners at the Accounts Payable and Procure-To-Pay Conference & Expo. October 23-26, 2016: Certify joined the more than 6,500 treasury and finance professionals in attendance for the AFP Annual Conference. The Certify booth was busy with product demonstrations and serving up refreshments for attendees. October 4, 2016: Certify hosted its third-ever user conference at the Marriott Marquis in Midtown New York. More than 100 accounting and finance professionals from 50 customer companies were registered to attend a full day of Certify product training sessions including tips, techniques and strategies. September 21, 2016: Certify joined the Association for Accountants and Finance Professionals in Business (IMA) for a discussion of key strategies, trends and technologies U.S. companies are using in 2016 to measurably reduce costs, improve T&E policy compliance and effectively do more with less. September 14, 2016: Certify hosted its second-ever user conference at the Omni Chicago Hotel in downtown Chicago. More than 100 accounting and finance professionals from 50 customer companies were registered to attend a full day of Certify product training sessions including tips, techniques and strategies. August 25, 2016: Join Certify and Accountex for a webinar to learn what accountants and T&E administrators are doing to improve the reporting process and reduce costs. July 25-28, 2016: Team Certify exhibited as a Gold Sponsor at the largest conference for small and medium businesses in the world, Sage Summit 2016. June 28, 2016: Certify and 360 Thought Leadership teamed up for a webinar where they discussed top trends and best practices in expense management today with data and analysis from more than 500 CFOs, controllers and accounting professionals. June 18-22, 2016: Certify joined nearly 1,000 CFOs, accountants and finance professionals for the Institute of Management Accountants' Annual Convention & Exhibition. May 25-27, 2016: Certify attended the 30th annual Windy City Summit treasury and cash management conference as an exhibitor, as well as sponsor of an interactive discussion led by the former Director of Treasury for the AFP titled, Discovering the Strategic Gold of Effective Expense Management. May 23-25, 2016: Team Certify flew out to Orlando to be a part of the largest, most comprehensive event dedicated to the issues and opportunities facing accounts payable practitioners at the Accounts Payable and Procure-To-Pay Conference & Expo. May 19, 2016: Certify teamed up with Ernie Humphrey, former Director of Treasury Services for the AFP for a webinar discussing the top challenges facing financial professionals as well as strategies to embrace potential opportunities. May 12, 2016: Certify and ride-hailing leader Uber bring you the latest data-driven insights and technology trends shaping the experiences and purchase behaviors of the modern business traveler. 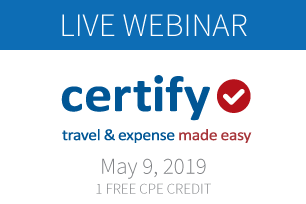 This webinar also includes a live product demonstration of the Uber for Business auto-expense feature integrated with the Certify Mobile expense reporting app. May 10, 2016: Certify hosted its first-ever user conference at the Omni Dallas Hotel in downtown Dallas, Texas. More than 100 accounting and finance professionals from 50 customer companies were registered to attend a full day of Certify product training sessions including tips, techniques and strategies. April 7, 2016: Certify joined the Association for Accountants and Finance Professionals in Business (IMA) for a discussion of key strategies, trends and technologies U.S. companies are using in 2016 to measurably reduce costs, improve T&E policy compliance and effectively do more with less. February 9, 2016: Certify joined the APP2P Network for an in depth review and analysis of the top trends and best practices in expense management today based on results from a recent survey of more than 500 CFOs, controllers and accounting professionals. January 28, 2016: Certify and 360 Thought Leadership teamed up for a webinar where they discussed top trends and best practices in expense management today with data and analysis from more than 500 CFOs, controllers and accounting professionals. December 21, 2015: Bob Neveu, President of Certify talks best practices in expense management and strategies to help maximize return on investment. October 25-27, 2015: Team Certify flew out to Las Vegas to be a part of the largest, most comprehensive event dedicated to the issues and opportunities facing accounts payable practitioners at the Accounts Payable and Procure-To-Pay Conference & Expo. October 18-21, 2015: Certify joined the 6,500 treasury and finance professionals in Denver for the AFP Annual Conference, where we displayed our leading automated expense management platform and handed our Robbie the Robots to attendees. 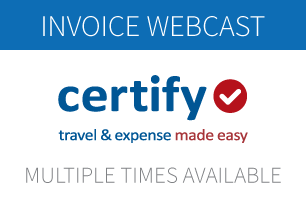 October 15, 2015: Certify and 360 Thought Leadership team up for a webinar where they discussed how the world of business travel and expense management has evolved beyond Excel and manual, paper-based T&E reporting processes. July 25-28, 2015: Certify exhibits at annual GBTA Convention in Orlando. See the highlights from the event in our blog post. 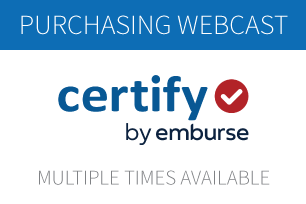 July 23, 2015: Ben Parker, Director of Business Development of Certify conducts a webinar covering the GSA per diem rate framework. June 20-24, 2015: Certify joined nearly 1,000 CFOs, accountants and finance professionals for the Institute of Management Accountants' 96th Annual Convention & Exhibition.